Home / Billing / How do I update my credit card information? To change your payment information on file, please log in to MediaHint (https://mediahint.com) and navigate to the My Account section. Click on the tab that says “My Plan.” If you have subscribed to a monthly or annual MediaHint subscription, in the “Payment Information” section you will see your current payment information. 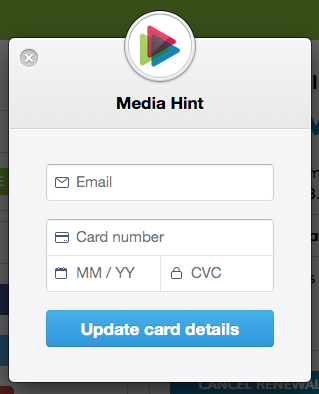 If you paid via card through our payment partner Stripe, click on the link that says “Update Card” to launch a dialogue box where you can input your login email address again for confirmation, then add new credit card information. If you paid via PayPal, please adjust your payment information within PayPal. If you have questions about changing from one payment method to another, please contact MediaHint support. How do I cancel the renewal of my paid subscription? I accidentally cancelled my monthly renewal, how do I re-subscribe? How much does the Premium Plan cost? © 2016 MH GLOBAL SERVICES, INC.
© 2018 MH GLOBAL SERVICES, INC.